Vision therapy is still somewhat controversial, but it is growing as a means to address vision disorders in children. Know some basic information here. Some eye doctors are strong advocates for providing vision therapy for children while others are not convinced that these techniques are effective. This practice is quite controversial with many health professionals providing arguments on both sides. We have outlined the basic practices of this therapy and the arguments that professionals make about them to help you determine whether or not this practice might be beneficial to your child. In most cases children that are shown to have poor vision receive surgery or eyeglasses to correct the problem. Sometimes, however, vision therapy is applied, which requires children to work with a doctor to perform a variety of exercises that train the muscles, eye and brain to improve their visual skills. This therapy includes physical therapy with the child working with filters, prisms, lenses and computerized lesson plans to re-train their visual system. It will take 30 minutes to an hour once or twice a week. There is no specific list of tools or techniques used for this process. Instead, your doctor will work to improve your child's vision without needing to succumb to the use of glasses or contact lenses. Many techniques used in vision therapy for children are also used on adults to treat eye strain or computer vision syndrome. The video below may help you understand it better. Science indicates that the brain has a strong ability to alter its structure and function based on the presence of external stimuli. It was originally believed that this was only possible for children, but more recent studies show that adults have these capabilities as well. These findings also indicate that regularly administering vision therapy programs can bring about the necessary neurological changes to improve visual performance. This includes issues with visual development, vision function or visual perception. Any time you believe that your child is suffering from vision trouble, a routine eye examination should be administered. This will involve determining the child's visual accuracy, typically by having them read an eye chart. If the child does not perform well, further tests can be administered to determine if they have the vision necessary to read properly or perform other basic skills. 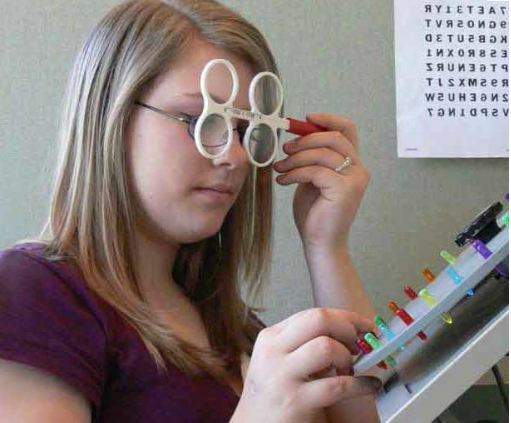 Non-refractive vision problems will need to be tested with examinations designed to measure eye movements, focusing, depth perception, eye teaming and visual motor and perceptual skills. This will allow a doctor to determine if there is a problem present that will require therapy. A specific therapy program designed to address these issues will then be administered. Amblyopia. Amblyopia or a lazy eye is caused when one eye cannot see normally so the brain begins to ignore it. Strabismus or eye teaming problems will regularly cause this condition. Strabismus. This condition is caused when the eyes are not properly aligned, making it difficult to focus on objects in the distance. Vision therapy has regularly been shown to positively impact strabismus based on the direction and magnitude of the eye turn. Accommodative Vision Disorders. Studies have indicated that near-far focusing skills can be sharpened with vision training. Eye Movement Disorders. The accuracy of your eye movement for close-up work or reading can be improved with therapy over time. Other Binocular Vision Problems. Phorias or alignment problems may cause fatigue and strain that can be corrected with therapy. Other Problems. Some vision problems that are associated with developmental disabilities or brain injuries can be corrected with vision therapy. Visual-perceptual disorders have seen improvement with these techniques as well. Orthoptics refers to straightening the eye, a technique that works on retraining the eye muscles that may be misaligned. This allows the entire visual system including the brain and eye itself to gain better control over your sight. The goal is to eliminate reflexive behaviors that are limiting the child's vision so that their vision will be corrected over time. Many believe this to be a more beneficial treatment option for strabismus as opposed to surgery. While sports vision training is not a form of vision therapy, it shares many similar characteristics. Those undergoing sports vision training are often given a specialized set of training programs to address the need of their sport. This technique is referred to as training rather than therapy because it is intended to enhance vision in a specific athletic situation rather than improving the patient's vision overall. Self-help vision programs are not intended to help people stop using eyeglasses or to address refractive errors or nearsightedness. Pencil push-ups or the idea of holding a pencil at arm's length then moving it toward the eye until you can focus on the letters stamped on the side, is not considered a full vision therapy course and should not be used in place of proper vision training. This form of therapy has been found to be ineffective in children over the course of 12 weeks unless it was paired with other treatment programs. The relationship between vision trouble and learning disabilities is often debated. Some believe that some learning disabilities actually stem from vision problems that make it difficult for the child to learn at a successful rate and correcting this vision trouble would return the child to their normal capacity for learning. Other ophthalmologists believe that there is no scientific evidence to back these claims and that children should be tested for astigmatism, nearsightedness or farsightedness before vision therapy or any type of vision correction is administered.